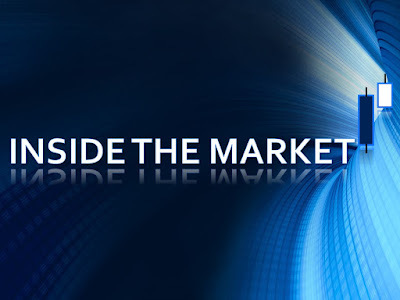 Inside The Market: The Patent-Box. The Patent-Box is a facilitated taxation of income arising from a certain types of intangibles assets like know-how, trademarks and patents. It is a way to encourage the investment of the firms in research and development. The beneficiaries are all eligible corporate income taxpayers, regardless of their legal form (corporate enterprises, partnerships, cooperatives, mutual companies, public and private), of their size and accounting regime adopted. The main requirement is the following : the abovementioned firms need to carry out research and development activities with the aim to product certain intangibles assets (internally or not). The excluded companies are those in liquidation and/or with extraordinary administration, as well as the firms that determine the income with fixed criteria and self-employed people. processes, formulas and information (industrial, commercial and scientific field, legally protected). The facilitation consists in deduction of income related to previous use which does not contribute to the generation of total income by 50% of the relevant ammount (30% for the fiscal year 2015, 40% for the fiscal year 2016 and 50% for the fiscal year 2017). In order to quantify the benefit, it needs to calculate the amount of income arising from the use of intangibles assets. With indirect use, the income is equal to the fees resulting from the use of the asset, net of tax-related costs. With direct use, it is equal to the economic contribution of the asset vs the total income of the company ("Ruling Procedure"). Then, we must also consider the allowable income share, on the basis of the ratio between the cost of reasearch and development activities, relevant of tax purposes (including the maintenance, growth and development of the intangibles assets) and the total costs, relvant of tax purposes, incurred to product such goods. 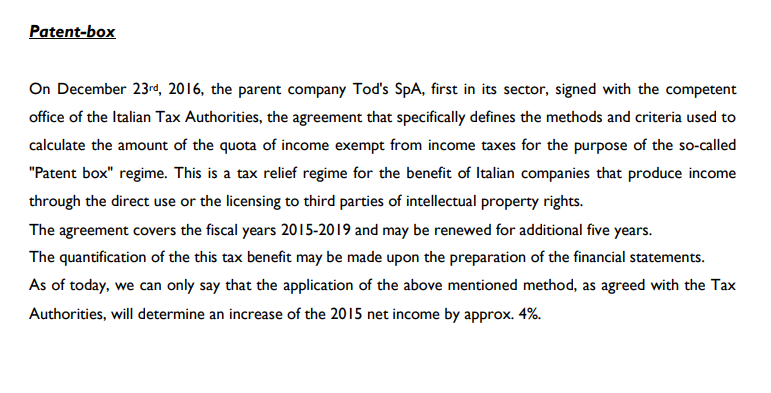 Finally, we can apply the deduction percentages (30%, 40% and 50%). The facilitated tax option has a duration of five tax periods. It is irrevocable and renewable. The option must be transmitted telematicly. The option covers the tax period during which is communicated and the next four. The option is significant in addition for the IRES and IRPEF income and also for the value of IRAP production. 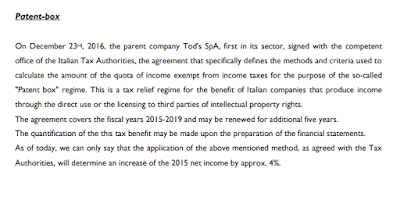 Lately, in the luxury sector we have had two examples : Tod's and Brunello Cucinelli. The benefit is estimated at the time of the earnings release. The regime covers five years (2015-2019). 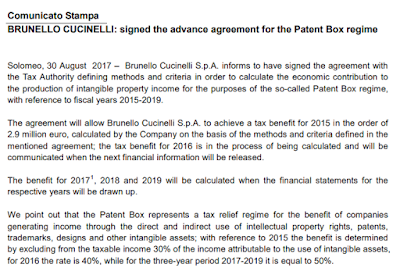 The same for Brunello Cucinelli : see the following image. 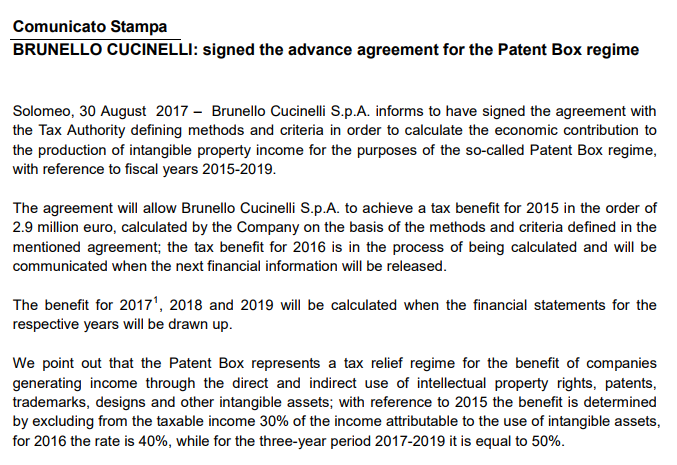 Patent-Box : Brunello Cucinelli S.p.A.
As we read in the previous documents, we can notice that the impact of the benefit is small. Simply, it is a surplus-value linked to fiscal and legal matters. Clearly and primarily, the intention of the legislator is to promote the use of the intangibles assets, without paying much attention to the effective higher income (generable).